Kering and the Rencontres d’Arles are pleased to announce a joint partnership and the launch of Women in Motion in Arles. The partnership aims to promote the recognition of women photographers and to advance the cause of gender equality in this artistic field. A major priority for the Group, Kering’s commitment to women extends into the world of arts and culture through the Women in Motion program. For although creativity is one of the most powerful forces for change, gender inequality in this area remains flagrant. For the past five years, Women in Motion has been a platform of choice for helping to change mindsets, for celebrating the work of leading figures, and for reflecting on the role and recognition given to women in arts and culture, since the issue of inequality still applies to all the artistic fields. Kering, a partner of the Cannes Film Festival, launched Women in Motion in 2015 to shine a light on women’s contribution to cinema, both in front of and behind the camera, and to provide a platform for promoting equality. The program’s prizes are awarded to inspirational individuals and talented young women, while its talks are an opportunity for people who have made their mark on the industry to share their views on the way women are represented both on the screen and within their profession. More than 50 talks have been held around the world since 2015 about the role of women and the issue of equality, not only in the movie industry but also in art and literature. Thanks to this new partnership, Kering is now able to significantly increase its commitment to women photographers. By becoming part of the Rencontres d’Arles, Women in Motion is joining forces with one of the world’s leading photography events, which this year will be celebrating its 50th anniversary. 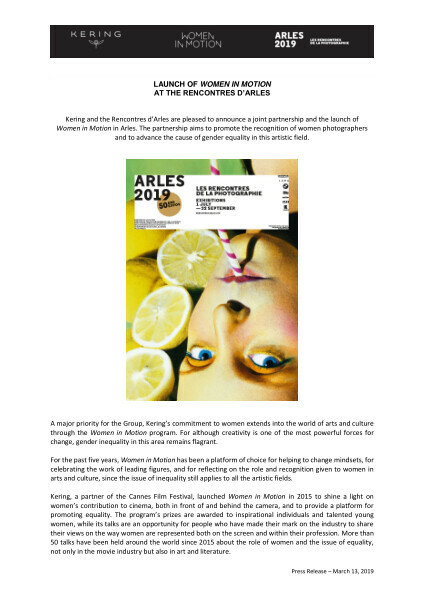 While continuing to help talented young photographers through the Prix de la Photo Madame Figaro Arles which it has supported since 2016, Kering is now creating the Women in Motion Award and the Women in Motion LAB at the Rencontres d’Arles. The Women in Motion Award will recognize the career of an iconic woman photographer, by acquiring some of her works with a donation of €25,000. The winner will talk about her experiences during an evening event at the Théâtre Antique in Arles. For the first few years, the Women in Motion LAB will be dedicated to a research program about women’s role in the world history of photography. * Women in Motion has been present in the world of photography since 2016, courtesy of its support for the Prix de la Photo Madame Figaro Arles which is awarded to one of the photographers whose work is on display at the Rencontres. The prize has been awarded to Laia Abril (2016), Paz Errazuriz (2017) and Wiktoria Wojciechowska (2018), while support has also been provided outside France since 2017 at the Festival Arles x Jimei International Photography Festival. A summer festival of photography that was founded in 1970, the Rencontres d’Arles have earned an international reputation by offering a detailed portrait of contemporary creativity in photography. Nearly 40 exhibitions are held every year in some 20 heritage sites in the city of Arles, providing the works with a unique backdrop.